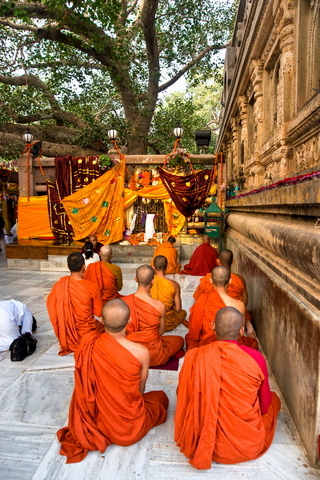 Buddhist monks meditating in front of the Bodhi Tree in Bodh Gaya (© Luciano Mortula | Dreamstime.com). Patna, Jan 7 (IANS) — “I am strongly in favour of turning Bodh Gaya into a vegetarian zone,” Richard Gere told mediapersons at Bodh Gaya Thursday before going to participate in a discourse on Buddhism by the Dalai Lama. He also appealed to locals as well as tourists to adopt vegetarianism. Richard Gere said he was happy to be in Bodh Gaya, and would love to visit it again. “I wish to visit Bodh Gaya again and again,” he said smiling. “Richard Gere arrived in Bodh Gaya Monday evening. He met Dalai Lama Wednesday. Gere is like any ordinary devotee of Dalai Lama. He may be busy in offering prayers, worshipping at the Mahabodhi temple and listening to religious discourses,” an official at the Tibetan monastery said. Richard Gere, known for his performances in Pretty Woman, Runaway Bride, and An Officer and a Gentleman, is considered one of Dalai Lama’s most high-profile followers. He regularly visits Dharamsala — the headquarters of the Tibetan government-in-exile in Himachal Pradesh. Richard Gere along with hundreds of Buddhist monks, nuns and devotees took out a candle light march in Bodh Gaya Wednesday evening appealing to people to adopt vegetarianism. The march was organised by Tibetans for Vegetarian Society, a non-profit public charitable trust. “Gere’s support to our cause will definitely create awareness and mobilise support of locals as well as tourists from abroad in making Bodh Gaya a vegetarian zone,” Tenzin Kunga Luding of Tibetans for Vegetarian Society said. The organisation has requested Bihar Chief Minister Nitish Kumar to make Bodh Gaya a vegetarian zone. Tibetans for Vegetarian Society have been campaigning since 2006 asking people to abstain from buying, selling, or consuming any form of meat during the pilgrimage tour in the holy land. The society has been spreading awareness about the drive through pamphlets, posters, stickers and signature campaigns. Luding said the society has been urging the people to follow vegetarianism within the Bodh Gaya zone, 110 km from Bihar state capital Patna. “Since Bodh Gaya is the holy land where the Buddha attained enlightenment, a vegetarian Bodh Gaya zone would be in accordance with the true teachings of the Buddha,” he added.